Antibiotics are generally quite helpful and Tylenol can help with pain. Complications can include a small tear in the ear drum, which heals quickly. The infections are not contagious. The eye discharge is contagious. The viral form usually accompanies a cold and lasts about a week. If it is bacterial, the discharge generally stops after three days of antibiotics. Warm compresses are helpful. Antibiotic drops or ointment may also be prescribed. Most sore throats are caused by viruses and accompany a cold. Strep (the Streptococcus bacterium) causes about 10 percent of cases, and the resulting infection of the throat and tonsils can look exactly like viral sore throat. Viral sore throats generally last about three to five days, and Strep usually responds to antibiotics within 24 hours. An infection of the lung causes fluid to collect in the air sacs. About 80 percent of infections are viral and milder. Twenty percent are bacterial. Bacterial pneumonia is usually more abrupt in onset and can improve significantly within 24 to 48 hours of antibiotics. Viral pneumonia is milder but can last two to four weeks. Cough suppressants should be avoided. Antibiotics are prescribed if necessary. 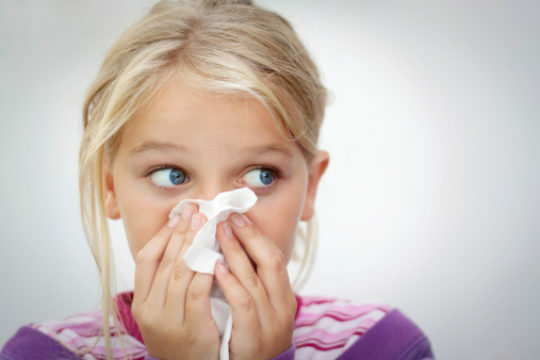 When Is a Runny Nose a Sinus Infection? Sinus infections are often heralded by pain and pressure in the face, thick nasal discharge, post nasal drip, fever, bad breath, nausea and chronic cough. Nasal sprays are helpful for opening sinus passages, as are decongestants. Antibiotics may also be prescribed. Fevers are not harmful, they are a sign that the immune system is working. Your child's behavior is far more important than the actual temperature. Most fevers range from 101° F to 104°F and last about three days. Your healthcare provider needs to see all babies younger than six weeks of age if they have elevated temperatures above 101.6°F. Febrile seizures may develop in 4 percent of children, but they are generally quite harmless.